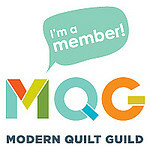 First, the Modern Quilt Guilds were asked to create charity quilts to be donated after QuiltCon was over. I had the honor of doing the quilting on Ventura Modern Quilt Guilds charity quilt and couldn’t have been happier with the results. I was also blown away by the graphic impact of Los Angeles Modern Quilt Guilds entry…just amazing! These were some of the top winners…they were pretty spectacular! But, I had some personal favorites, too.